I never planned on making public what I’m about to share. But I seriously believe the authors are underestimating their children. I don’t know what caused them to make that point and I’m not going to guess. If I had the chance, I would tell them that your children do know. And here’s how I know that . . . . .
It’s really hard to sum up the last eighteen years of my life and the last eighteen years of work that both of you have done for me and my sister. Mom, thank you for all the work you put in for my education, all the stuff you had to put together and all the planning you had to do every year. I fought you all the way, always letting you know how much I didn’t like school; you even threatened me more than once to put me in traditional school. You were my alarm clock every day for the earlier school years and ever since I started using my own alarm you have been making me breakfast every day. Even before all that you would make our family dinner almost every night. I couldn’t imagine doing that every day. Dad, thank you for all the work behind the scenes that you do for our family. While mom is home taking care of us, you’re taking care of our family in a completely different way by providing the money it takes to get me to where I am today and keeping others safe by keeping criminals off the streets. And most of all you’ve been the best role model of what a man really is. You guys are the best team of parents I could have ever asked for, from coming home late and wrecking a care you two have always been so forgiving and caring. Through all that we have been through both of you have always kept Christ at the center of our lives, always keeping me pointed in the right direction and supporting me through everything and always being there when I needed you. Thank you for everything, I love you guys. See? They do see and know exactly how hard you work, how much you give your family and how much they are loved. Those three points can be achieved both in and out of the home, but please never think that by choosing to be a stay at home mom your kids think you do nothing. There are pros and cons to any situation. I’m trying to reenter the workforce now and it isn’t easy. In fact, I’ve had 0% success while applying for about 40 jobs. But I don’t regret the years I was able to stay home with the kids. It was worth it all. Three or four months ago one of my friends posted a link on Facebook. It was a Huffington Post article about an organization in Texas that makes “angel gowns” for babies who never get to go home from the hospital. Their mission is to never have any grieving parent look through the lost and found tub at the hospital looking for burial clothes for their child. Or to have to go shopping during this horrible time. To make the gowns, women donate their wedding dresses and the volunteer seamstresses use those for the angel gowns. The gowns are donated to hospitals through the NICU Helping Hands organization. 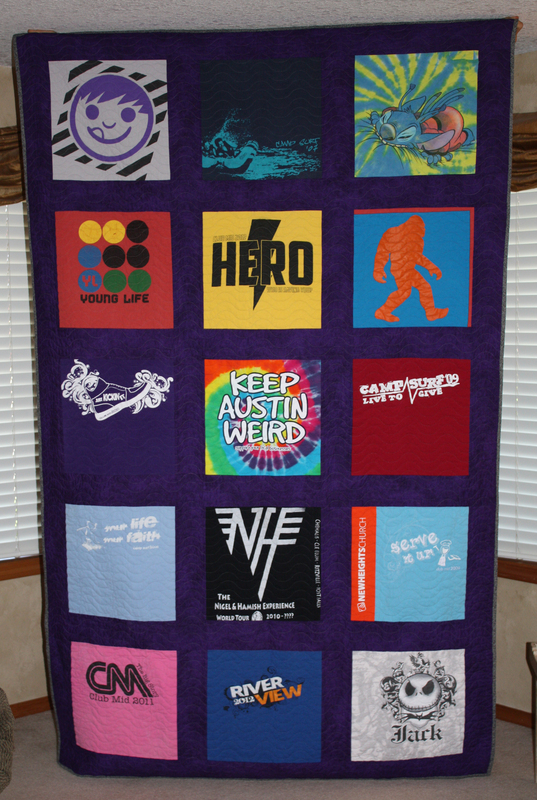 I read the article shortly after I finished Austin’s t-shirt quilt. While I was making his quilt all I could think was, “I have got to figure out a way to sew more.” But seriously, how many quilts does my family need? And quilting can be an extremely expensive hobby. None of them would be caught dead wearing anything I made for them. As soon as I read the article, I knew I had to find out if I could sew for them. Helping Hands is located in Texas. But they ship gowns all over the US and Canada for the volunteers! I signed up and was accepted. As you can imagine, the HuffPo article caused donations, volunteers, media inquiries, etc to explode. Due to the overload, I’m still waiting for my first wedding dress (which I have been told will ship out in the middle of July). However, if anyone wants to donate to me directly, I can accept those as well. I guarantee I will use every spare inch of the dress for angel gowns. I have been tremendously blessed with two children who were healthy from day 1. I’m sewing as a way of giving back thanks for that. I also want to help parents in the worst situation any way I can. Being able to mix my love of sewing with my love of people is giving ME the blessing. I can’t wait to get started!! Sometimes my son’s hoarding tendencies work in my favor. Over a year ago, he gave me the t-shirts he didn’t wear or had outgrown. They were in the Goodwill pile and I either saw something on Pinterest (this will probably be on my tombstone) or someone mentioned it on Facebook. Suddenly I realized I HAD to make one for my son. It was more than just a bunch of old t-shirts. When Austin was going into the 6th grade, he went to his first summer camp with our church. He was changed. He had a spark lit in him that hasn’t diminished to this day. He saw the counselors and leaders were high school/college age kids and he made it his life’s goal to become one of them one day. Before all that happened, he loved every camp, day camp, etc. he went to with our church. And then when the time came, he became a leader. In fact, tonight he’s filling out another summer leadership application for his 5th year in a row. So in January I finally got started. I had to take advantage of the times he wasn’t home and that wasn’t easy. He’s still homeschooled, but he does half the day at home and half the day at pre-engineering classes. Thus began covert quilting. This meant I had about 2.5 hours a day to work. Which led to hiding all (and I do mean all, he’s a quick one) evidences of sewing. I don’t have a sewing room so I took everything out then hid it back when I was done. I put all the fabric scraps in grocery bags and took that to the outside garbage. I set up and took down the ironing board, cutting mat, sewing machine, etc. daily. Crazy times my friends, crazy times. There was a banquet at church for the seniors last week and we thought that would be the perfect time for him to open the quilt. Most of it had to do with church any way. His first question when he realized what it was, “When did have the time to make this?” I explained my covert ops to him and he said he was truly surprised. I rarely surprise him so this was extra sweet. I explained that I made the top, sent it out to be quilted and then did the binding myself. And the thread I used to sew the binding belonged to his beloved Nana who now lives in heaven. He did get choked up at that part, as we all did. I think he likes it. He relived all the memories with each shirt with us. He had a couple of friends come over after the banquet and the first thing he did when they got here was to show them the quilt and explain it to them. And he hasn’t let it touch the floor since. It was a wild work of love and I thank God for the memories the quilt represents. If you’re my friend on Facebook, you know that I’m having an existential crisis of sorts. 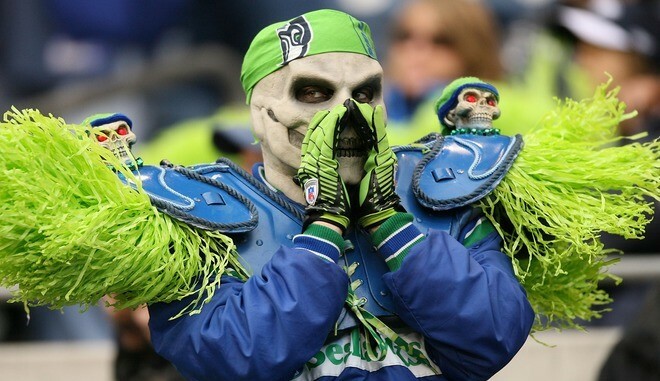 After decades of not caring about professional sports, I am suddenly excited about the prospect of the Seahawks going to the Super Bowl. I don’t know what is happening to me or why. I’m very confused and everything I have known has been shaken, and I’m struggling to make sense out of life again. During my pedicure I was the only client in the shop which left four employees with nothing to do. I was happily reading my book (Evolving in Monkey Town by Rachel Held Evans – highly recommend to anyone) when the loudest, collective gasp I’ve heard in recent memory disturbed my reading reverie. I looked down at my pedicurist (is that even a word?) and she’s completely turned around looking at the t.v. She’s still massaging my calves so I hadn’t noticed. Then I look at the t.v. Mind you, that was the only word of English anyone had spoken, save greeting me, the whole time I was there. So I laughed. And almost dropped my e-reader in the tub where my feet had been. Then I was embarrassed. Of course it was much better than this time so I didn’t commiserate for too long. I agree completely with her sentiments but I think I know why in these types of situations the offenders get more attention in the media. I believe that in our western culture, we think that if we can just figure out why someone did something bad, then we can prevent it from happening again and our world will be a safer place. I think the core issue is that we believe that we’re in control of what happens in our world. And if we can just find the cause, we are certainly smart enough to prevent it from ever happening again. We see over and over again the media asking, “How did this happen?” “Why did this happen?” “What is the root cause of this evil?” One of the most disturbing instances of this was in the wake of the bombing at the Boston Marathon. And if the offender is young, good-looking, smart and has a wide circle of friends (all too happy to speak to the media), it seems as if the coverage never ends. Here’s what I want to know. Why don’t we as a society pursue with the same amount of determination what makes certain people so honorable and self-sacrificing? What makes a person like Officer Libke volunteer for something as dangerous as law enforcement? 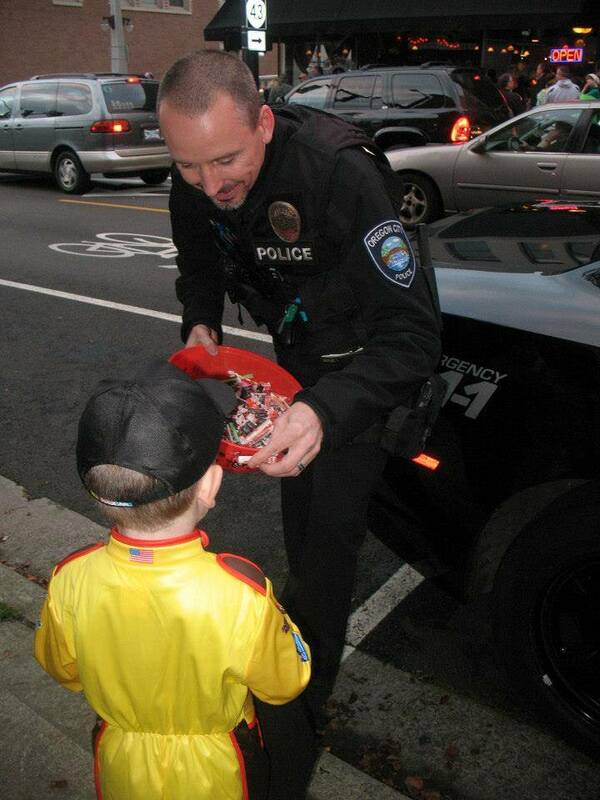 What made him pass out Halloween candy just 4 days before he was shot? What makes first responders do what they do? What drives some cops to get up early, on a day off and participate in “Shop with a Cop” without pay and usually without a good night’s sleep. What makes them get involved with Police Activity League and spend the day fishing with a bunch of kids? What internal force propels a person to become a firefighter? To walk headfirst into fires that you’ve been taught all your life to have an escape plan for? And the military . . . . . in the new age of terrorism it seems like we’re always fighting something. It would make sense that people wouldn’t enlist anymore and the draft would have to be reinstated. But that hasn’t happened. 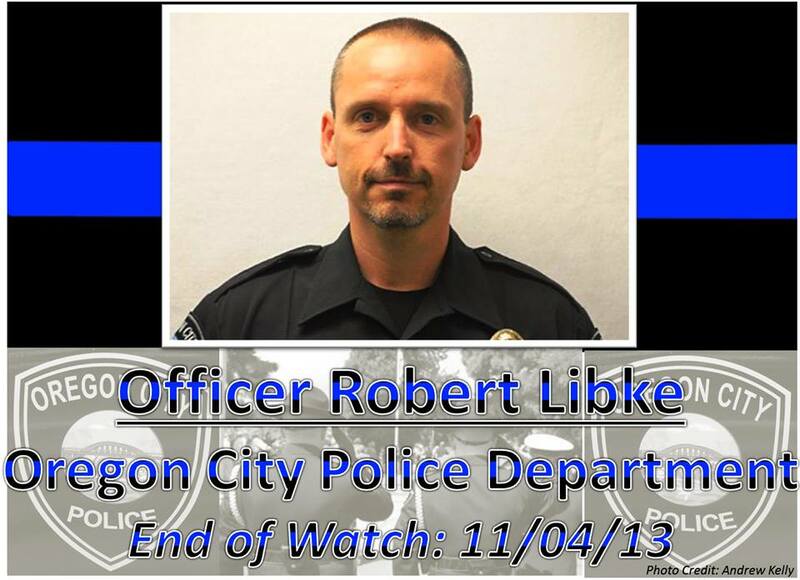 But for now I will offer my deepest condolences to Officer Libke’s family, law enforcement family and friends. Go in peace and rest on glory’s side. He drives away from me daily to one of his three joys . . . . church, soccer or engineering classes. He’s taller than I am by a long shot and has been for years. He loves The Walking Dead and Breaking Bad. His wardrobe consists entirely of skinny jeans and band t-shirts. Bands whose lyrics I can’t understand. And right now he’s in the backyard looking for bugs to feed the large spider who sits on the large web. He’s been like this his whole life. Never have I been able to keep him indoors. Oh, it’s gotten easier the past couple of years. But he has never given up his wonder of the outdoors and all the creepy-crawly things that inhabit it. I pray nothing can ever keep him indoors and the wonder of creation will hold his attention. For his whole, entire life. For my birthday this year I asked Tyler to take a week off of work so we could clean out our garage and organize what was left after my ruthless, brutal purging. He agreed and my inner organizational nerd was on cloud nine. Since I learned so much about cleaning out said garage, I thought I’d provide you with a quick and easy description of how we did it. 1. Move into your house and wait nine years to clean out the garage. Continually pile stuff on top of boxes you never open, rollerblades that haven’t fit the kids in years, dilapidated scarecrows (I’m not kidding) and useless priority boxes from the post office. 2. Have your husband take a week off work. But make sure he has the type of job in which he can be called out in the middle of the night for hours even though he’s off and so many people on the team are on vacation that he has to be available (they covered for him when we were out of town). Make sure this happens twice during the week. Twice. Also make sure your husband forgets to take himself off the overtime list so one of his supervisors can sign him up right in the middle of the clean out. 3. On day one of your organizing adventure, borrow a friend’s pickup truck. The family we borrowed it from are saints. I love them; no bad thing can be thought about these people. It’s not their fault that the air conditioning in the truck is insufficient and the windows aren’t tinted to block the raging sun. Find the shelves you want to buy and proceed to southeast Portland in the late, hot, traffic-laden afternoon. Try not to cry. Go home, shower, collapse on the couch and convince yourself you had a touch of heat exhaustion despite the 5 gallons of water you drank. 4. Eliminate all distractions. In order to keep the dogs from whining, howling, baying and barking inside the house and in the back yard (which will distract and annoy the life out of you), put them on leashes and tie them up in the driveway. That way when you’re putting the trash in a pickup truck, they will be underfoot at all times. If you want a clear path to the backyard to get items out of the way, it will double as the perfect place for the dogs to rest and relax. You also need to put them on a long enough leash that they have free range of the garage to smell all the new smells you’ve uncovered. And be under your feet at all times. 5. Establish a vicious circle. It works like this: Your garage needs to be facing due west with no trees providing pesky shade. Work during August when the weather is almost assured to be hot. This year the unexpected humidity was a nice little bonus. Thanks to the west-facing garage, you will be bathed in unrelenting heat for most of the afternoon and evening until the sun ends its reign of terror and starts to set. This will render you exhausted, sweaty and stinky beyond your wildest dreams. You will be unable to wake up at a decent time in order to start your garage cleaning in the cool of the early morning. Vicious circle. 6. When at the dump with a truck bed full-to-overflowing, dry heave into your shirt. Force yourself the breathe through your mouth even though the humidity laden air is just thick with grossness. The smell will follow you home. 7. Have an out of town cousin call and say he’s unexpectedly in town. Offer to let him sleep on your couch. Then get the bright idea to invite your entire family over and cook them all breakfast the next morning. It was wonderful and I’m so glad he came to visit. Breakfast was great. It was all good. 8. Husband will need to take an extra day off work to make up for the callouts and overtime. This one is pretty self-explanatory. 9. Have a bunch of stuff left over that you’ll “just put in the shed.” This one takes a little bit of time to understand so hold on and concentrate. When you buy your house there needs to be a shed on the furthest back part of the property. This part of your property is under power lines. Your realtor MUST inform you that the shed belongs to the power company. ** Seven years after moving in and ignoring the shed, let your curiosity get the best of you. Borrow your dad’s bolt cutters and cut off the lock. Inside you will find a musty cavern full of gardening supplies, sprinkler system elements and two metal signs that say “do not build anything under the power lines.” In your sad shed’s defense it isn’t really under the power lines. Thanks to ignoring the shed (you can’t see it since it’s in the wooded part of your property) the roof is rotten and needs to be replaced. So that leads to the next weekend . . . . . .
10. Leave the stuff you were going to innocently put in the shed in the garage. The next weekend, cut back trees, clean out the shed, rip the roof off the shed and put in a new floor. Again, the heat and humidity are nice surprises. And in the middle of his three day weekend it is imperative that your HUSBAND WORK OVERTIME that he signed up for weeks ago, long before your bright idea to clean out the garage, so now you have a roofless shed with a pretty new floor. Today marks the two week anniversary of my birthday present. I see a light at the end of the tunnel. At this point I’m just praying it’s not the oncoming train. And my garage? It’s so beautiful, organized and uncluttered that I’m tempted to sleep out there some nights. But then I realize the air conditioning is on the inside of the house and I stay put. **Just last night we realized that our realtor probably couldn’t disclose anything about the shed since it probably shouldn’t be there. It also explains why the previous owners never left us a key to the lock. We have called the power company and explained it to them. They have been out here a few times over the years to trim the branches back from the power lines so they have seen it. They said as long as it isn’t in the way of the power lines or their maintenance, they don’t care. I freely admit I’m a snob when it comes to where to eat. The Portland metro restaurant scene is a thing dreams are made of. To name a few . . . . Andina . . . . Portland City Grill . . . . Bortolomi’s . . . McCormick & Schmick’s . . . . Wild Abandon . . . . Pambiche . . . . La Bottega . . . . and the sushi. Oh the sushi. There are no words for the sushi bars here. This list doesn’t begin to scratch the surface of the dining options, but these are definitely at the top of my list. Now I’m hungry. And day dreaming. And completely unfocused on the task at hand. Thank goodness there isn’t anything shiny around or this would be the end of this post. Last night we met friends at Famous Dave’s Barbeque. Yes, a chain. We have a few local barbeque places that are awesome – Buster’s BBQ and Goldie’s. (If you’re local, you now have the “Busters bar-be-quuuuuue” jingle stuck in your head. I’m not sorry.) The whole anti-chain thing didn’t cross my mind because a.) I was excited to meet our friends there, and b.) I was so hungry/exhausted from helping Tyler tear the roof off the shed all day. We could have been going to McDonald’s and I would have been happy. So here’s my take on this chain: The smell was intoxicating, the service was amazing and the food. Oh the food. I was in foodie heaven. At a chain. My brain had trouble wrapping around that fact, but I finally told my brain to shut up and enjoy the succulent Smoked Tri-Tip Platter. It was all I could do all night long to keep telling Tyler repeatedly how good my food was. I think I was even tempted to wake him up in the middle of the night and tell him in case the 15 times I told him last night weren’t enough. Maybe it reminded me of my childhood. My dad is from the south and we had a LOT of red meat bbq-style food growing up. My dad is an excellent cook and my mom adapted to his southern ways. So there’s my confession. This snob enjoyed a chain. And I plan on enjoying that particular chain again. I might have to rethink my whole way of choosing restaurants. Boy oh boy did I get smacked upside the head today. But first the back story. Just over three years ago, my son got very, very sick. He ended up with a purple rash on his feet. After consulting the terror-inducing Google, I panicked and got him into the doctor as soon as I could. The doctor looked at the rash and said she needed to have other doctors come in and look at it. That really doesn’t make a mom feel good. After they looked at the rash with way too concerned looks on their faces, they all left. I followed them out and cornered the doctor we had come to see. I told her that my mom had cancer, had just been given 3 – 6 months to live and I was in a very bad place. I needed to know what was going on with Austin and to please not keep anything from me. When she returned, she told us that she was ordering several blood tests. She added that she was unsure what the rash was indicating but it could be anything from mono to cancer. She said she would put a rush on the tests and we should know by the end of the business day. This would be where I passed out. Seriously? I just told her about my mom and she felt the need to scare the living crap out of us? I could NOT believe she said that in front of my son before any tests had been run. In the lab waiting room I assured Austin all would be well. The lady who took the blood knew something big was being researched and was very kind. I have never seen such big vials for blood in my life. I tried to play it cool. But once we got home I lost it. Phone calls were made to the husband and the best friend. They were both very sweet but nothing could make me feel better. Around 4:30 I could take it no more and called the doctor. They passed me right through to her (when does that happen?) and as soon as she talked to me I could hear the smile in her voice. All was well. She had just talked to the hematologist and was almost 100% sure that Austin just had a very nasty virus. He just needed a follow-up, much less scary, blood test at the end of the week (those turned out just fine, too). I have spent the last 3 years mad at the doctor. I almost filed a complaint with the clinic. I felt she didn’t need to guess about everything under the sun in front of us. I would have preferred her to give me the results of the tests. So, yeah, I’ve been very mature about it and been pretty much outraged at her. I’ve noticed something over the past three years. I’ve had friends and heard of people who have had very scary blood tests taken. All of them included the possibility of cancer. It didn’t hit me until today that never ONE TIME have I heard of anyone getting the test results back the same day. Most have been made to wait a couple of days or longer. By the way, my biggest concern about the whole cancer discussion was that she did it in front of Austin. I didn’t want him worried over nothing. To this day he says he doesn’t even remember her saying that. Nor does he remember me telling him in the waiting room of the lab not to worry about cancer. I thought he’d be traumatized and he wasn’t even aware. Maybe that’s a lesson I need to remember when I’m tempted to over-mother. This, this is what I would say. Christ makes a difference. He’s not a formula to keep us from all pain and discomfort. He’s not a guarantee that our kids will turn out “right.” He’s not a Santa in the sky that will make everything the way we want it if we just pray harder. But HE MAKES A DIFFERENCE. We have a family very close to us going through a horribly difficult time. It’s as bad as it gets and I’m not overstating anything. Their situation has been ongoing for years. It was out of their control – not a result of bad decisions. There has been little relief from the pain, and no relief from the effects of trauma for one family member. In the counselor’s office they are told that rarely if ever a family goes through this and is not ravaged by substance abuse, trouble with the law and every other bad thing you can think of. Yet in the midst of unspeakable pain and trauma, there is stability. There is health. There is a community they have become a part of eagerly waiting to embrace and support them. There is no substance abuse. There is no bad company that corrupts good character. How does this happen? How can a world that is waiting to devour an aching, war torn soul with disastrous non-solutions not get a foothold? I believe it is because of this: when they could have easily blamed God for all their problems, they instead focused on Him as their hope to endure their circumstances. I don’t have a logical explanation for awful or unfair because I’m not the one writing the story (taken from “One Thousand Gifts,” Ann Voskamp). But I do know what I’ve seen. That in the midst of every thing, there is hope. A long road of healing gaping wounds awaits this family, but it is not without hope. A non-religious counselor recently told them, “Maybe it’s because of your faith.” I am convinced it is. The faith-hope of a relentless mother fighting for her children. The faith-hope of a Comforter. Christ in me, Christ in me, the hope of glory. Amen and amen. It's me . . . . . just a Pacific northwest girl who is crazy about Jesus, her husband, her kids and not-so-much her dogs.